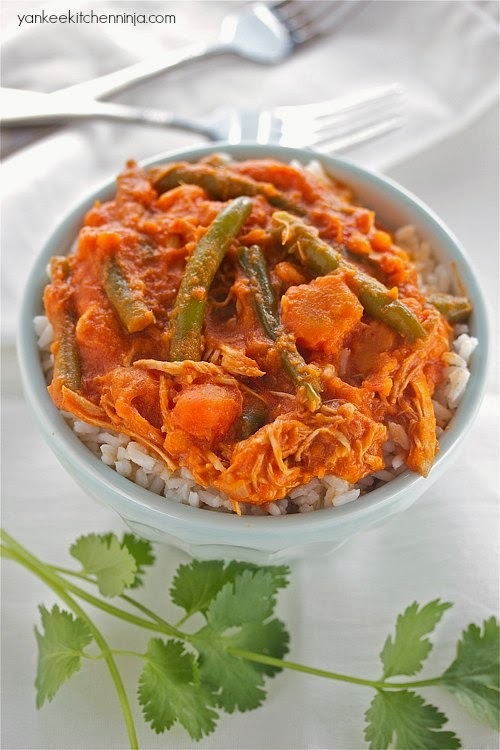 Slow cooker chicken and sweet potato curry requires little effort but yields lots of delicious dinnertime results -- plus plenty of leftovers. Based on my Pinterest feed, you'd think that no one eats anything other than cookies, pecan pie and party appetizers during the entire month of December. While cookie exchanges, office potlucks and party dessert tables are all awesome, let's not forget that there are still a whole bunch of dinners that need to be made and eaten this month. Now, that doesn't mean those dinners have to be elaborate or complicated -- let's save elaborate and complicated for the buche de Noel and gingerbread houses. With everything you've got going on, you need at least one thing to be simple. And what's simpler than a slow cooker dinner? Pretty much nothing, my friend. Regular readers know that, as much as I love CSA produce, I'm just a wee bit of a meatasaurus. Case in point, this chicken and sweet potato curry. I adapted it from a vegetarian Bon Appetit recipe, touted for its ability to please everyone, no matter what their food issues. Well, oops -- I just screwed the vegetarians and the vegans by adding chicken. But unless you're a vegetarian or a vegan, you will thank me. 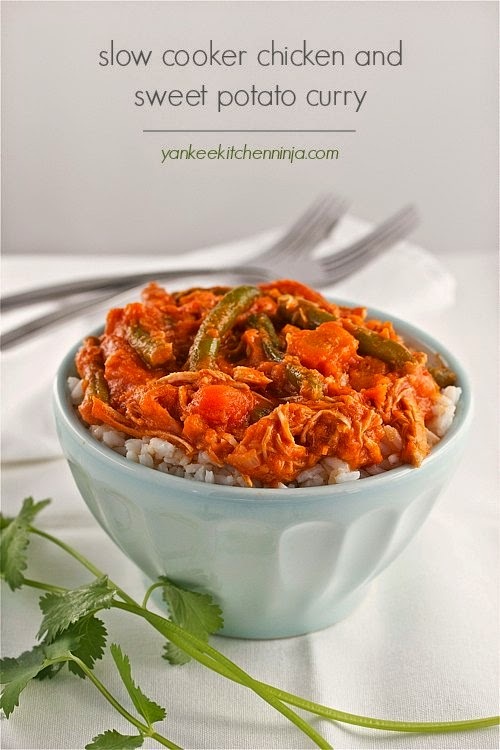 This slow cooker chicken and sweet potato curry is a fantastic low-effort, one-pot meal -- and has quickly become one of our favorites, especially when you top each serving with a big swirl of Siracha. And did I mention that it's just as good as leftovers? What's your favorite quick-and-easy meal during this crazy-busy time of year? Leave a comment: The Ninj wants to know. Combine the first 6 ingredients (lemongrass through tomato paste) in a small food processor or blender and process until smooth. Scrape the paste into the crock of a slow cooker. Place the chicken on top of the paste, followed by the sweet potato, carrots and shallots. Pour the tomatoes and coconut milk over the whole mixture, cover and cook on LOW for about 5 hours or until the chicken is easily shredded with a fork. Add the green beans and cook another 30 minutes, until beans are cooked but still crisp. Shred the chicken in the crock using 2 forks. Season to taste with additional salt and Sriracha. Serve over white rice and top with green onion and cilantro. You're welcome, Linda -- hi from Kentucky! We just got a 2nd slow cooker so we can do two of your recipes at the same time !! Aw, too kind, Jeff! I've got 2 -- you won't regret it! I think those would be fine substitutions -- enjoy!